My art gently connects, appreciates and interacts with the miracles of every moment. Whether abstract or fanciful, dreamlike or representational, my images are visual metaphors. When exploring and playing with material possibilities and limits, surprises and the unexpected lead the way. I have permanent mosaic installations at the Albuquerque Zoo as well as the Botanic Garden’s Dragonfly Sanctuary and was commissioned by the Norman Oklahoma Arts Council to create a mosaic at their Lions Park. My work can also be seen locally at The Range Cafes, Rust Medical Center Chapel and other businesses, schools, developments and private homes in New Mexico. It has been included in publications and articles. 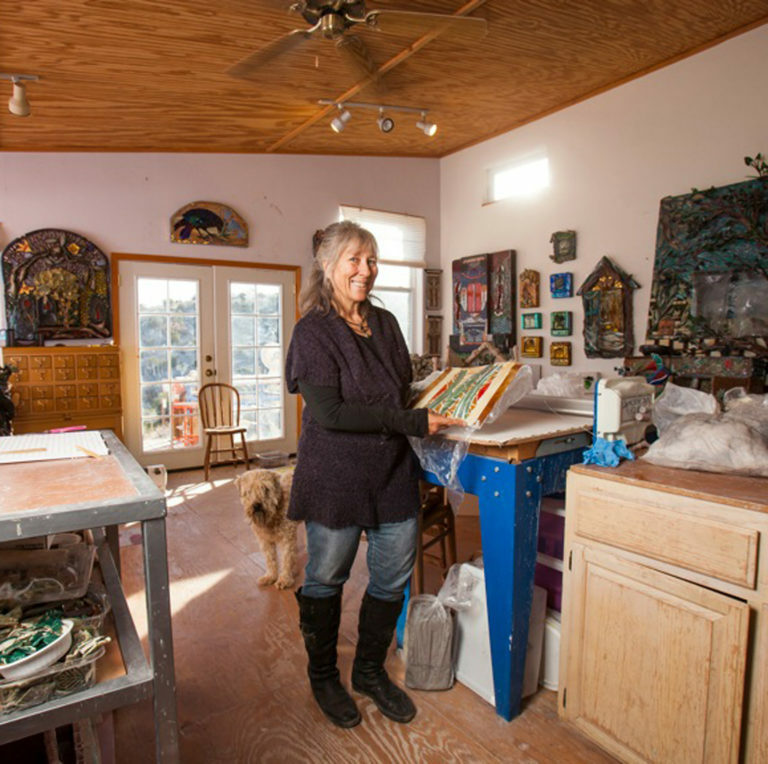 I am a founding member of Mosaic New Mexico and part of Wild Hearts Gallery – both collaborative ventures. Mosaic is an excellent medium for community involvement and I co-directed the seventy foot long Placitas Community Mosaic mural, Protect Our Wildlife Corridors. I received a BFA from Carnegie-Mellon University where I primarily studied printmaking. A teacher for twenty years, I helped to found Bosque Preparatory School in Albuquerque and began their art program. I became a full-time professional mosaic artist in 2003. Joy, as well as detailed work is inherent to my mosaic process! June 2016 Organizer of Water A Mosaic New Mexico group show. New Grounds, Abq.